The young pilot has made an historic achievement: being the first Portuguese to race in MotoGP. Red Bull wants to engage the consumer on this celebration, inviting him to a digital challenge, according to its claim “Red Bull - Wings when you need them”. Isobar was the one to put this challenge into practice through the breakthrough website https://mo88.redbull.pt/. New or usual consumers, Miguel Oliveira fans or motor sports lovers can play and win prizes, or send supporting messages to the athlete and watch their selfie on the young pilot’s official helmet. In the case of the supporting messages, the users are carried from the digital to the real world by the chance to preview in real time their selfie on Miguel Oliveira’s customized helmet, a completely innovative feature that uses 3D. After buying an Hero Can, if the user wants to play he should enter the code on the website and just have fun! Exclusive prizes await the most skilled. This mission was embodied by Isobar Portugal through a breakthrough solution, with an attractive design and a user-friendly navigation. This formula was only achieved with “a lot of team work” and specially with “great fun”, according to the developer Paulo Afonso, lead developer and Miguel Mateus, Art Direct at Isobar Portugal. For the tech addicts, an algorithm was developed to determine the texture slots in which the pictures/selfies are seen. On the website, the user can also know more about the pilot and his career. 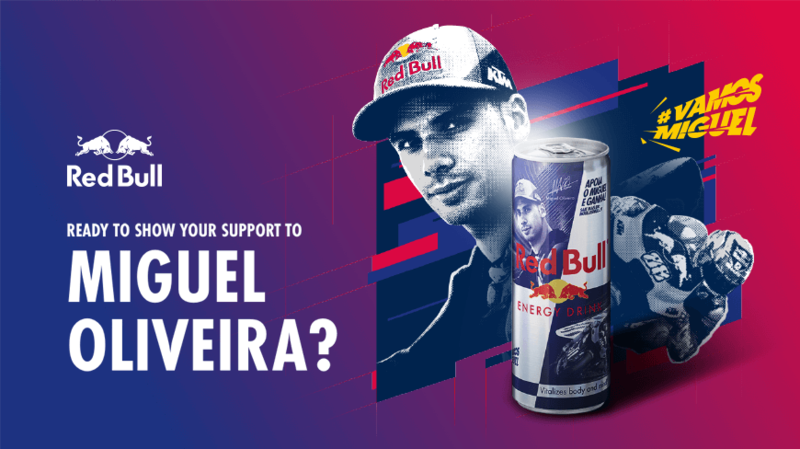 In the end, there is a common goal: to promote in a worthily way the name of Red Bull, Miguel Oliveira and Portugal. "Best UI Design, Best UX Design and Best Innovation". These were the prizes awarded by this website that has only been online for 2 weeks now, and also a Special Kudos award, given by CSSDA. It was also considered Site of the Day on 28 March 2019 at csswinner.com and received a Honorable Mention at the awwwards.com.